A small Buddhist Peace Fellowship delegation went to Burma to bear witness to the suffering of the people following the brutal crackdown by the Burmese military at the end of September on monks and the people of Burma. They wanted to communicate the support and solidarity of the international community with the people of Burma, and to be a voice for the voiceless by sharing with their communities on return. The communities had expressed their concerns and given generously, and the donations were offered to various groups to let them know that the rest of the world deeply cares about Burma. They wanted to explore channels for future further support inside Burma, as well as finding ways to support the monks in exile. The participants included two from Thailand including a socially engaged Buddhist monk, Hozan Alan Senauke, a Zen priest who is also from Buddhist Peace Fellowship USA, and Jill Jameson from Buddhist Peace Fellowship, Australia. Jill has worked with people from Burma since 1994 facilitating grassroots leadership training, peace building and conflict transformation. Inside Burma and on the Thai-Burma border we met with activists, monks, students, orphans, Western diplomats, and ordinary people in teashops and restaurants. We listened to their stories about events of the last several months, and how they are continuing to work both for the liberation of Burma as well as for their survival and that of their families. Wherever we went, people were very happy to meet with us, and welcomed the opportunity to share their stories. The generals want the international community to believe that everything has returned to 'normal', that Burma is safe again for tourists, and that the disorder from the protests is over. But the 'normality' for Burma under the military regime is a state of fear and repression. This verbal whitewash from the regime was very different from what we learned from the people we met. Neither army, police or beggars were evident in downtown Rangoon, but we heard from 'Aung Myint' that beggars and the homeless had been taken to detention centres, and that some of the army were dressed as monks at Shwedagon Pagoda, and others were in plain clothes. Our group was investigated on one of our visits to a monastic orphanage by plain clothes police and fortunately, giving out packets of noodle soup to the children had not been a crime. 'Dr. Win' told us that many people just outside of Rangoon can only afford one meal a day, and that with fuel increases some people cannot afford the bus fare to go to work. We visited several Buddhist monastic schools and orphanages. At one of these there were 500 students, and often there was not enough food, only a little rice. Large classes of children sat at cramped benches, and the large dormitories smelt of neglect. During our visit, a health worker was lifting shirts to reveal ulcers and extensive ring worm, which were dabbed with a sulphur cream. Malnutrition, over-crowding and limited staff to care for the children surely exacerbate the problem. The families of children at such an orphanage as this cannot even afford the low fees of a government school. In the Rangoon Division alone we heard there were 162 such Buddhist orphanages. There are also many run by Christian denominations. 'Betty' who visits orphanages in other states, said there could be 'be hundreds of thousands of orphans'. Often, she said, the child's father was a soldier who had been killed, and mother may have been injured by a landmine gathering food in a forest. We also heard these children referred to as the 'scrap children' where many families are too poor to feed all their children. And their future? Many have no option but to join the army, or, to become a monk. And monks and soldiers are about equal in number. But many children are also forced as conscripts into the army. Recent reports of child conscripts as young as 10 years have reached the international media. The regime's response to this we heard from 'Stephen' was to fine either the child or its parents, anything to avoid responsibility being taken by the generals. We had heard how one prominent monk responding to the food shortages had set up a food station to produce low cost boxed meals to distribute through downtown shops and in rural areas. The Venerable was very reluctant to talk about this and fear was palpable. We had hoped to be able to contribute to this program but suspect the program may have been suspended. The 'normality' for Burma under the military regime is a state of fear and repression. People are controlled not only by military force but also by fear. This is all pervasive. People often speak in code to avoid being overheard by unknown security people in plain clothes, or by informers so poor and desperate for basic survival that they will inform on anybody. We also touched this fear with our main concern for our friends not to suffer the consequences of talking with us. But there was also an increase in anger and urgency since last I was in Burma. San, a gentle elderly man confided he would like to get rid of the leaders somehow for the greater good of all. Sitting at tea shops, people would approach us with a common theme; 'life is so difficult now', and '90 per cent of the people are against this regime, and please do tell the international community' and 'do take our message to the Security Council'. All we could do was listen. And as Buddhists, this is a valuable practice. So many people had a deep need to talk and share, to tell the whole story so often in all its violent and brutal detail interspersed with jokes. Impossible to understand other than in terms of fear and power, and possibly history. Aung San Suu Kyi, the democratically elected leader of Burma, threw some light on this back in 1991. "It is not power that corrupts but fear. Fear of losing power corrupts those who wield it and fear of the scourge of power corrupts those who are subject to it," she said. Since September, people are suffering deeply from the brutal onslaught on the highly revered monks in a country where 90 per cent are Buddhist, and where respect for monks is deeply imbued in their culture and way of life. Many monks we heard had been forcibly disrobed so they could be tortured. And it was not 2 per cent of the monks as claimed by the generals who marched, but nearer 30 per cent were involved in the protests. They were compassionately drawing attention to the recent dramatic increases in rice and fuel costs. They knew intimately of the people's plight - their begging bowls providing an indication. Despite their poverty people still gave a little rice to the monks. People often speak in code to avoid being overheard by unknown security people in plain clothes, or by informers so poor and desperate for basic survival that they will inform on anybody. We heard from 'Stephen' that there were four categories of people in the protest. There were those who were guilty by looking, those who clapped, those who offered water and those who marched. Only the first three categories were released after a month's interrogation, and then only if they signed that they would never again protest. The fourth category is probably still in detention. 'Stephen' also shared with us that his college friend, who was now a colonel, had revealed details of the invasion of a monastery while drunk, and that he was under orders to beat up monks when questioning them. These are humanitarian concerns, and we need to keep asking where are the monks and the people detained? We further heard from 'Stephen' that soon after the protests ended, that the crematoriums had been running at the unusual hours of 1 to 4 am. 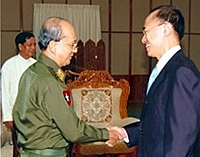 'Peter,' a reliable source, indicated numbers killed were much higher than given by the regime, and would seem to be higher than in the report by the U.N. Special Rapporteur on the human rights situation in Myanmar, Paulo Pinheiro, Dec 7, 2007. We heard that 30 monks were killed in Yangon and more than 70 people were killed in detention after the demonstrations had stopped. 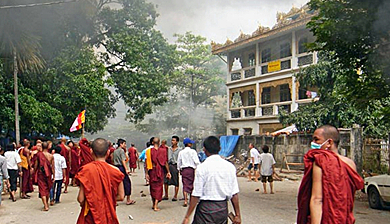 Pinheiro reported that 31 monks had been killed and a further 74 listed as missing, and up to 1,000 still detained - 106 of these were women, of whom six were Buddhist nuns. We heard on a visit to one monastery, that the nuns from nearby had left. What has happened to other nuns in Burma? An English teacher monk at a monastic school and orphanage for 500 children said there were now 15 monks, 35 novices, 12 teachers and 80 resident children. Prior to September, there were 200 monks and novices who have not been heard of since their participation in the 'revolution' and who had fled. They were to make contact but nothing has been heard. It is feared they are in detention or worse. On the Thai-Burma border there are many local organisations, such as the Assistance Association for Political Prisoners. There were photos of political prisoners around the walls and a prison model exhibition, depicting the forms of torture employed. And yet speaking with 'Myint,' a survivor of torture and 15 years of prison, including several years in solitary confinement, we were left in no doubt about the extraordinary courage and ardent commitment to democracy, freedom and dignity of many of the activists. Only the first three categories (those who were guilty by looking, those who clapped, those who offered water) were released after a month's interrogation, and then only if they signed that they would never again protest. So how is the military crackdown impacting on Buddhism? On the one hand, many monks have gone from being revered to now being treated as criminals. On the other, meditation would seem to be strong. Some political prisoners we met, have survived long incarceration and torture and overcome deep depression through meditation. Some monasteries such as Maggin in Rangoon have been closed and the HIV/Aids patients it cared for have been dispersed. There are 3,000 Buddhist monasteries throughout the country which provide accommodation, food, care and education for many children, and we could not get answers as to who is now taking responsibility for the children. On the Thai-Burma border we met with three different groups of monks who had managed to flee. Their number is surprisingly small given the 100,000 monks who actively participated, leaving grave concerns for the safety of those still in Burma. We heard that some monks from Mandalay had fled in terror to the border, disrobed and are now working as migrant workers. Other monks who have fled are living in three safe-houses set up for 51 new arrivals from September. Despite being out of Burma, they have great difficulties. They have been forbidden refuge in Thai temples - three police cars were seen outside one temple keeping watch. They have no travel permits and, if caught, may be very heavily fined or be sent back to Burma. UNHCR is also no longer registering asylum seekers. On the other hand, resettlement of refugees in third countries such as Australia and the United states is having a de-stabilising effect on border communities. Those people with some level of training, such as health workers and teachers are being given priority causing hardship for the local communities whose resources are already severely over-stretched. Despite the fear, the poverty and with little hope of change, people we met demonstrate huge generosity, a great sense of humour and deep caring for their country, which was once the rice bowl of Asia, and with many highly educated people. Many have found ways to survive, of finding opportunities in the cracks between conflict and possibility, of taking one step at a time. There is a refusal to give up - people rising up again and again in full awareness of the consequences and risks to their lives and those of their families. Their message is very clear and urgent - enough is enough, and it is time for freedom. There is a growing movement with resonances of pre-independence India led by Gandhi. This mostly underground democracy movement inside Burma has strong links with a developing civil society and local organisations on the borders, linked with increased awareness and strength of an environmental movement. But it would seem that unless the international community intervenes little will change for the people of Burma. Now is the time. There were pleas from many we met not to allow their Asian neighbours to accept this 'normality', and a warning not to accept what the generals say. So, I feel a deep responsibility to speak out, to share as widely as possible, that life in Burma is 'not back to normal'. People have been disappeared. Far too many. Where are they, and what has happened to them? The intense and pervasive fear and gross human rights abuse contravene international conventions. Even those not in official detention are in effect in detention in a place called Burma. There were pleas from many we met not to allow their Asian neighbours to accept this 'normality', and a warning not to accept what the generals say. It is not evident that they care one scrap about the people they control. We in Australia should support the broad based democracy movement and the people inside Burma with a passion for freedom, on the need for dialogue and reconciliation. There are no easy solutions and the wounding has been long and deep but the question now that we have all seen the pictures and heard the cries for help, how can we continue to respond? I feel we must prioritise the freeing of political prisoners including Aung San Suu Kyi, and encourage dialogue and reconciliation. There is also a great need for healing and humanitarian support. Note: Jill Jameson is a member of the Buddhist Peace Fellowship. This is an account of her visit to Burma in early December.